Massage cow's milk butter on your scalp to treat premature graying of hair naturally at home. For best results, follow this easy home remedy twice a week. Boil a few Amla (Gooseberry) pieces in coconut oil till they turn black. Apply this mixture on your hair to cure premature graying of hair naturally at home. Take 1 tablespoon of table salt in 1 cup of strong black tea without milk .Massage your hair with this water. Wash off after 1 hour. Follow this home remedy regularly to cure premature graying of hair. Boil 250 grams of mustard oil with 60 grams of henna leaves and apply this preparation on your hair to cure your gray hair naturally. Massage your hair and scalp with this mixture at least twice a week. Boil a few black walnuts in water for 15-20 minutes. 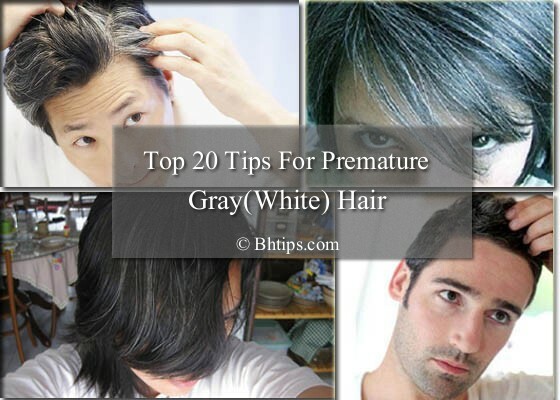 Keep on your hair for 30 minutes to color your gray hair naturally at home. Eat 5-6 walnuts daily as they are the rich sources of copper, and zinc. Both are responsible for the formation of melanin pigment which turns white hair into black. Massage your scalp with neem oil. Neem oil not only prevents graying of hair but also prevents scalp infections. For best results massage your scalp with pure neem oil twice a week. Take 1 tablespoon of almond oil and mix with equal amount of lemon juice. Apply this mixture of almond oil and lemon juice for 30-45 minutes to cure premature graying of hair naturally at home. A mixture of coconut oil and lemon juice is also very effective in restoring black hair. Massage your scalp with mixture of coconut oil and lemon juice to treat premature graying of hair. Apply this mixture to your hair and scalp, massage for few minutes and let it absorb for 45 minutes and then wash off with your regular shampoo. Amla has been shown excellent results in treatment of various hair problems including premature gray or white hair. Apply amla paste or pure amla oil on your hair to blacken and thicken your hair. Curry leaves are very beneficial in restoring natural black color of hair.When the leaves are boiled in coconut oil, the oil forms an excellent hair tonic to stimulate hair growth and bring back hair pigmentation. Ribbed gourd boiled in coconut oil is also an effective remedy for premature greying of hair. Dry the pieces of this vegetable in the shade. Then soak the dried pieces in coconut oil for 3-4 days. Then boil the oil till the solid is reduced to a blackened residue. Then massage the oil into the scalp for few minutes. It will help enrich the hair roots and restore hair black pigment. Take 1/2 cup of rosemary and half cup of dried sage. Boil both the ingredients in 2 cups water, for about 30 minutes. Let the mixture sit for 2-3 hours. Now, apply it throughout your grey hair and allow it to dry. Once dry, shampoo your hair. Repeat the procedure on weekly basis, until you see your hair getting the desired shade. Both ginger and honey are very helpful in getting rid of gray hair. Grate 1 cup of fresh ginger. Mix with 1/2 cup of honey and place it in a jar. Eat 1 teaspoon everyday. This simple home remedy is also considered very effective for treatment of grey or white hair. Deficiencies in folic acid(Vitamin B9) and biotin(Vitamin B7) can directly cause gray hair. Vitamins B-6 and B12 are vital to the production of red blood cells, which is how oxygen and nutrients are transported to your scalp. Vitamin B-2 assists hormone production and balance body systems that affect hair color. Foods rich in B vitamins include dairy products, whole grain breads, cereals, pastas, poultry, meat, eggs and green leafy vegetables. Foods rich in anti-oxidants also important to prevent gray hair. Take foods rich in anti oxidants for destroying the free radicals which damage the hair cells.Vitamins A, C and E are a group of powerful antioxidant nutrients. Vitamin A rich foods include orange-yellow vegetables and fruits, dairy products and dark leafy green vegetables. Vitamin C is found in raspberries, blueberries, blackberries, strawberries, citrus fruits, potatoes, melons and tomatoes. Vitamin E can be found in leafy green vegetables, nuts, beans and wheat germ. Iodine is another mineral that is important for maintaining hair color. Try to consume more foods rich in iodine in your daily diet plan. Foods rich in iodine include bananas, carrots, spinach, and fish. Selenium plays a vital role in the action and production of hormones, including those related to hair health and the aging process.Selenium is frequently used in treating gray hair and has a role in fighting the aging process and free radicals. Selenium rich foods include shell fish, tuna, salmon, wheat germ, raisins, walnuts, mackerel, Brazil nuts and sunflower seeds. Take iron rich foods to prevent and stop graying of hair. Sunflower seeds, red meat, dried apricots, wheat and parsley are good sources of Iron. Copper deficiency can also significantly contribute to premature graying. One of the ways to prevent gray hair is to eat foods containing high amounts of copper such as turnip greens, spinach, beef liver, sunflower seeds, cashews, lentils, almonds, clams, crabs, oysters and egg yolks.